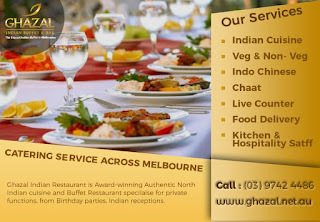 Ghazal Indian Buffet & Bar provides Indian Food Catering services in Melbourne. We can cater your next party, company function, wedding, baby shower function, re-union party, Diwali or chrisoms party or any other event you can think of. From small to large events, our Indian Food catering services will come to your site with lots of delicious Indian dishes expertly prepared. If you are interested in having us cater your next event, please contact us or call 0397424486 for package details and talk to one of our Indian catering specialists. Do you plan on having a grand function or reception soon? Thinking about the ideal venue? Why not choose an Indian Restaurant Melbourne to host your next big event? You could choose it to have a baby shower, birthday party or even a corporate event venue Melbourne. Hosting a function can be a taxing time as there are lots of things that need to planned and implemented. Having one at a vegetarian Indian restaurant Melbourne can help to take the stress out of many things and allow you to enjoy your time and tend to your guests. 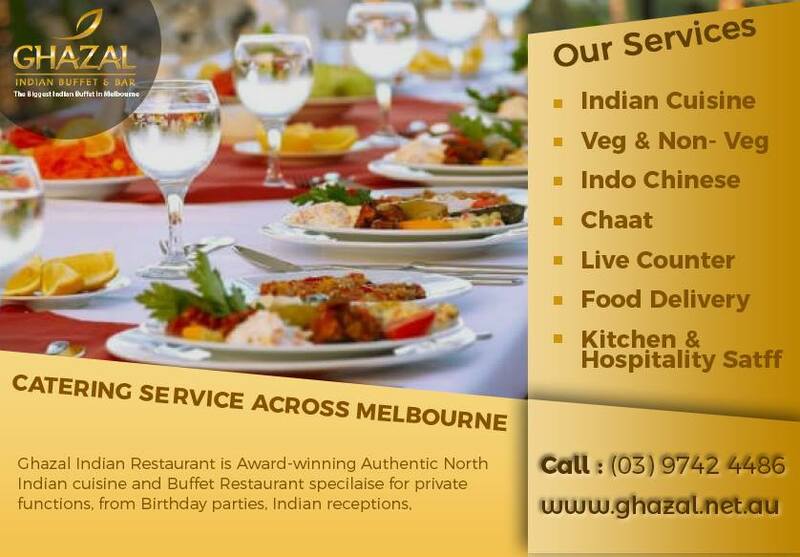 Ghazal Indian Buffet & Bar is a well-known Indian restaurant based in the western suburbs of Melbourne which is the ideal to host small function venues Melbourne. They even offer the option of catering so if you decide to host your event at your venue, you have the option of having some great tasting Indian food at your disposal.